Stephen L Richards said, “A quorum is three things: first, a class; second, a fraternity; and third, a service unit” (in Conference Report, Oct. 1938, 118). 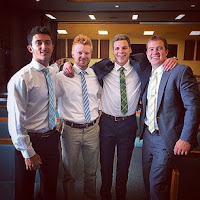 In many ways an ARP group is a lot like a priesthood quorum without the priesthood. When I first came back from my mission I continued attending meetings every week, but I was going haphazardly to whatever meeting was most convenient. So I didn’t really get to know anyone and I didn’t feel like the meetings were as meaningful. I don’t mean to discourage anyone who feels the urge to go to a meeting to wait until his/her regular meeting comes. Meetings are always good, especially if one is willing to let the Spirit work. But, I found that I didn’t have the meaningful experience that I really needed every week, the experience that I had grown so used to before my mission when I attended the only meeting that was available within a 30 minute drive of my house. I decided that attending the same meeting every week would be the best situation for me. And from that experience, I came to learn how a weekly group can be like a quorum. Like the quote from Elder Richards says, a quorum should be a class, a service organization, and a fraternity. In a group we learn from each other like we would in a class when we share our personal experiences “as [they] relate the tools of recovery, [that] week’s step, or the step [we] are currently working on.” We serve each other as sponsors and sponsorees (it is a two-way service!). And we are a brotherhood of men who are overcoming addictions. I would strongly encourage anyone who is struggling with an addiction and willing to do whatever it takes to recover, to find a meeting that works consistently and become a regular. The friendships and bonds will be a powerful support and assist you in consistently working the program and continuing on the path to recovery.